National Parks Adventure is the one of the latest documentary shorts from filmmaker Greg MacGillivray, who specializes in these short IMAX exhibition films. Narrated by Robert Redford, this particular film follows a group of family friends on their adventure through the splendor of the American National Parks from the Redwood Forest in the Pacific Northwest to Glacier National Park and the Everglades and Arches. Filmed in celebration of the 100-year anniversary of the national parks with world-class mountaineer Conrad Anker, adventure photographer Max Lowe and their friend, artist Rachel Pohl, this grand film is filled with the awesome imagery that Greg MacGillivray is a master of – aerial shots of red rock canyons, rushing rapids, ice caves that look like shimmering ballrooms made of jewels, and young brown bears learning to catch fish in river. While these films are always too short to do more than merely scratch the surface of things like the history of the parks, conservation, and climate change, they do not disappoint with their spectacular imagery and their ability to inspire one to get out and, as the saying goes, find America. National Parks Adventure comes to 4K Ultra HD in an HEVC 2160p encodement of the IMAX source with HDR10 high dynamic range framed at 1.78:1. 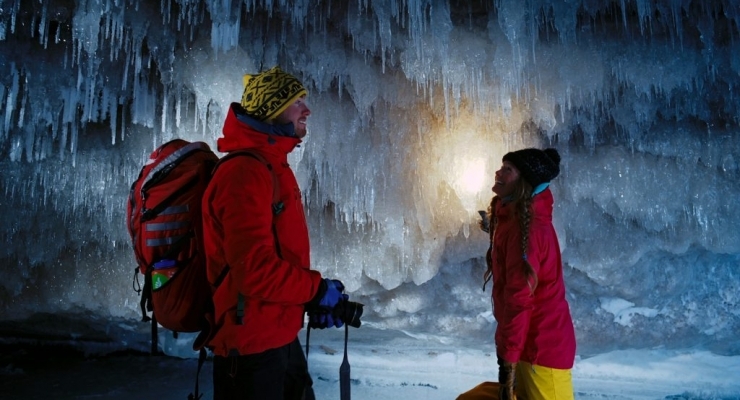 The superior detail of the IMAX format is immediate, every crack in the stone, every ripple in the water, and every gradient in the ice can be seen. Colors are fantastically vibrant and varied thanks to the wide color gamut of the HDR10. At Yosemite, for instance, one can see the variations in color in the water between deep blue, azure, and clear, where on the Blu-ray everything looks flatter, the same goes for the tree line in the background where the aquamarine horizon just turns into an amorphous blue and more blends into the shadowy trees. The biggest issue with the 4K disc, which may have less to do with the HDR and more to do with how it was just mastered in general, is it appears to have a lower gamma setting – it looks dark. In fact, comparing the 3D disc — which is equally spectacular and filled with a superb amount of depth, clarity, and minimal crosstalk – the overall brightness on the 4K disc looked almost as dark as what I was seeing in 3D. The included Dolby Atmos immersive audio mix for National Parks Adventure makes awesome use of the format. In the Redwood forests the sounds of birds chirping come from the distance overhead and behind us. A forest fire roars with depth and we feel overwhelmed and trapped, the rush of the rapids is disorienting. The height channels are also effectively balanced in for the numerous AAA tracks used on the soundtrack. The narration from Redford is full and upfront. An awesome big screen format documentary that celebrates and retraces the historic camping trip between Teddy Roosevelt and John Muir and the creation of the national parks system, National Parks Adventure is eye candy, ear candy, and a spectacular document of the great American outdoors. In this IMAX documentary short from Greg MacGillivray celebrating the the 100-year anniversary of the national parks, world-renowned mountaineer Conrad Anker, adventure photographer Max Lowe and artist Rachel Pohl travel throughout the national parks including Redwoods National Park, Arches, Glacier National Park and the Everglades, and retrace the historic camping trip between Teddy Roosevelt and John Muir. 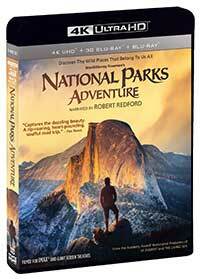 National Parks Adventure is eye candy, ear candy, and a spectacular document of the great American outdoors. The 4K Ultra HD, Blu-ray 3D, and Blu-ray all look and sound awesome, but the 4K disc's HDR encodement could have been a bit brighter.